October - it arrives every year with all of it's color and wind and smells and shadows and darkening skies and crisp mornings and silver gray cloud cover and Halloween decorations and chain saws roaring and spices and soups and pies and stews simmering. Oh yes, October is wonderful. ominous, fierce, vibrant with color and prepares us for the sometimes harsh and yet often beautiful and crystal cold Winter. I am reminded and stimulated and triggered as my senses are bombarded with Autumn's reasons. My Dad died in October, October 22nd 1984. Twenty five years ago. I will honor him with his own post - later in the month. I will tell you all this. This past weekend was the Durham Fair - my folks went in 1984. My Dad wore a 10-gallon hat and a green suit jacket - other fair goers thought him to be a celebrity of some kind. In many ways he was. And the weekend before that was the Guilford Fair. I went with my Mom and Dad and my kids in 1984. I had a sprained ankle but I hobbled about. I can still see my Dad sitting with the stroller that held my son who was just a baby at he time. My Dad died a few weeks after the fairs. I never went again. Not once in 25 years. I hold the memory of going with my Dad quite sacred. October holds other memories for me. Memories of past trauma. All part of my truth, my "it's"....life-changing events. I was first abused by the the teacher in October. 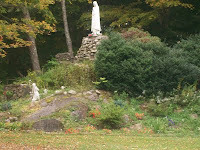 The Monastery, pictured above, holds strong memories. I met Jill for the first time on a Friday evening at a church event - it was profound and intense and we blended easily in part because of our similar pasts and in greater part because of our admiration and trust in James. We sat in my car that night for hours smoking cigarettes and telling each other everything. James told us to and so of course, we did. 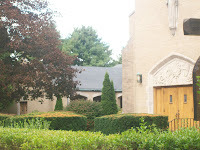 On the following Sunday my girls wanted to go and ride our horse so I dropped them off at the stable and wen on to the Monastery with my son for Sunday Mass. The Monastery is in the North part of our Town quite a ways from the main church down town. The priests, James and Daniel took turns coming to the Monastery to officiate 10:00 Mass. James was very charismatic. He walked down the main aisle in the small chapel often stopping and placing a hand on some one's shoulder and lifting a child up. He wore jeans and sandals and placed himself amongst his flock of faithful people, all in awe of this spirited man speaking the "word" like no other ever could. Jill came to Mass that day too and I felt a tap on my shoulder and she handed me a card. She slid in a few rows behind me. We followed James back and forth from the Monastery to the big church down town. We sat on the benches on the Monastery grounds amongst statues and gardens and 'stations of the cross' and we talked and talked and laughed and cried and loved and promised. We watched my son play. Over time, as I was turned over to Daniel for my continuing therapy. Jill would follow James and I followed Daniel. James and I had been developing the 'Pastoral Counseling Center' and Daniel and I were going off in another very secretive direction in the name of Jesus, healing and redemption. It was all quite sick. Daniel was visiting me at my home, and having me sell my house and intended to use some of the proceeds to add on to a house he owned and I would move in to his house with my children. I was willing to follow him any where. Come early October Daniel took me away for a weekend - and it was then that I surrendered to the final intimacy. And two weeks later, on a Thursday on October 15h was the final so called therapeutic attempt where Daniel believed that by re-creating my childhood trauma I could finally have a voice and power and I would be free. It ended horribly with Daniel back handing me for resisting him and James finding me on the floor with a split and swollen lip. Later when I asked James to 'tell what he saw' to my lawyer he refused and said he saw nothing. The ultimate betrayal. Eventually Daniel left the priesthood quietly and a few months later so did James - to marry and become re-ordained in a different ministry. Jill went away and never looked back. I missed her terribly. 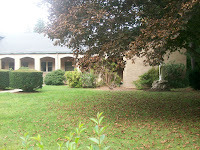 The Monastery had started as a place of trusted worship and belonging to a faith community. I loved going to Mass there - The cloistered nuns were on the other side of the chapel behind a filtered meshing so they couldn't be seen. I could hear t hem and they sang like angels. I recall sitting with Daniel for hours after Mass - he would plan our Thursday session and tell me what to expect and be ready for. I really believed that both James and Daniel were sent to me from God - that I was special, chosen even - I couldn't have been more wrong. And so yes, I do give some time and thought and reflection to some of the life changing events of October. For years I ran from my truths and that was very costly on many levels. Now, as Autumn approaches and I am triggered and I remember I don't need to run or hide or escape. I can honor my memories, my truths because to not do that is to deny myself "me". I don't slump in the pain or give in to the horror or feel like a victim - I am in charge now and I have been for a long time. They have no power in my life. I recall walking home after the first time with the teacher and somehow knowing that if I took off my shoes and felt the rough road on my feet I would not feel him. To this day I heal through my feet. God was looking out for me back then - I didn't know that then but I do now and have known for a long time. James and Daniel served many purposes in my life as did Jill. I will tell you that despite how James betrayed me he did introduce me to the Jesus in me. I have nurtured that truth ever since. And Daniel? He gave me the opportunity to fight back - I never knew I had it in me but I did, I do. 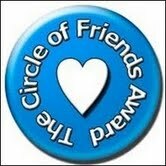 And Jill - I know I loved her with purity of heart and her leaving our friendship was about her, not me. I learned that to love well is never wrong regardless of how it ends. The teacher - well, I learned that there is evil in this world - a lesson that has cautioned me and saved me many times over. And so this October as I travel by the monastery - I will honor my memories - each one is of value and purpose - many were life changing and most are still a driving force - except now I am in the drives seat. Amen. I took these pictures the other day when I was out and about. The two pictures of the lake were taken right at the bottom of the drive up to our home. 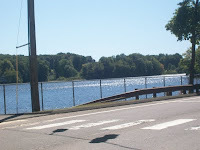 It is called "Lake Quonnipaug" and is in Guilford, CT. If you care to 'check it out' more fully you can google it!! :-) The farm land, upper left photo is at the end of the lake. It is a dairy farm. 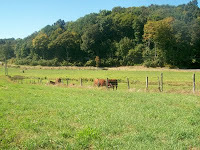 We live in a lovely rural area with so many offerings of simple living and natural settings. I/we are truly blessed. 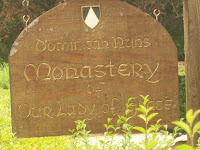 I also took pictures of "The Monastery" which will be posted on an October blog. It is a cloistered order of Dominican nuns. It will be the back drop for my "October-memory" blog. For those of you who have followed my truths, my "it's" you know well that October is particularly cathartic and I honor that catharsis, actually I encourage it because it is my truth to remember. If anyone wants to read one of the posts that tells this story it is titled "James-Daniel-Jill" and posted 9/4/08. If not, that's okay too. I also want to tell you all that since I stopped expecting my daughters to act/behave/choose/live as I saw fit - I am so free. And, their freedom to just openly share with me has blossomed fully. There is a distinction this time of which I am so aware. Before, when they felt free to just "be" because I wasn't challenging them, I was pretending - hiding my true feelings of disappointment, hurt and so forth. This time I am not hiding anything because there is nothing to hide. I am REALLY free of judgment and desire to control and fix. Good Lord . I love them no matter what. I said to Skipp - "Now that I stopped being a jerk they are free to be themselves". He said, "oh honey, you weren't being a jerk" and I said, "ya, I was". :-) It is so good to be able to admit shortcomings. I feel better physically too. I STOPPED checking my BP because I was obsessed. Once I stopped and just relaxed and made better choices every day I could feel myself stabilize, balance and simply feel better. I have been holding stress over my disability insurance, and adjusting to my being home and to going out - wild huh?? :-) I know I am in transition - and I was doing it with my heels dug in as I resisted the movement - not anymore. I am gliding along now - like an ice skater on a smooth lake. Oh I know there may be a few bumps on the ice or I may grind my skates in to the ice and come to a screeching halt. -but that is temporary and will only last long enough for me to gather my thoughts, re-direct and start to glide again. My Mom and I had a wonderful afternoon. Above and to the left is Gator Creek - a quaint local farmers market. My Mom loves to go there and buy fruit and corn and pies. That's her just above and a bit to the left, bag in hand. On top and to the right above is the Clinton Marina - just down the street from where my Mom lives in her 'in-law' apartment attached so nicely to my sister's home and nestled in a country setting. The water is so peaceful and she loves going and so we went. We sat and spoke gently and lovingly while breathing in the salt air and being calmed by the smooth water's surface and the breeze on our faces. The sun was glorious. I love her beyond expression and she loves me too. She always says I am "a breath of fresh air topped with a ray of sunshine'. How nice is that? And my Mom is a pillar of faith and hope, love and wisdom topped with a delightful sense of humor and all of which I hold oh so dear. 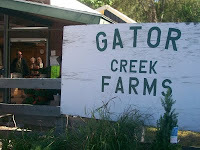 I went to visit last week too and we went to Gator Creek then, as well. It was different last week for many reasons. I am changing, transforming and last week was the end of a type of metamorphosis where I finally squeezed out of my protective cocoon and have begun to fly again. I had retreated in to my limits and to where I felt safe for several months, avoiding face to face human contact in public places as much as possible. I know why too. I feel the most normal at home and with those who know me well and love me. I am barely aware of my limits at home - and very aware the moment I step out my door. I have been transforming so I can feel normal despite the limits and celebrate my freedoms more fully. I must confess I have not been doing that. I have been hiding as best I can. I will tell you that yesterday when I chose to move through my fear of being in public and possibly meeting up with people I know that haven't seen me in a while and they see me with my rollator??!! I am so unable to tell them the truth when they ask what happened!. I have created a couple of elaborate stories to "explain" who I am walking with a rollator or a cane. My favorite is that I tore a nerve while hiking in the woods with my dog. Ya. that's a good one. Good Lord!! I don't expect you to understand this, some of you may, some not - and if you don't or can't please don't tell me how wrong I am for my feeling this way - or why I shouldn't hide my truth - I know this! This is part of the transformation journey/process to surrender, to truth and claiming my truth with resilience, dignity, confidence and pride. And for the record, it can be difficult to navigate parking lots, especially when there are no handicap parking spots available and long lines and often 'rough' terrain with a disability like M S. But I did, I went out by myself and went to four different stores and did what had to get done. I didn't meet up with anyone that knows me - phew. But when I do I am going to say it for the first time outside my circle of family and close friends - when whomever asks what happened that I need a rollator? I will answer truthfully, "I have M S and this helps me do what I like to do". I have to remember I am a person first and that my having M S is a detail not a definition of me. And a BIG "thank you" to Mark over at 'The Naked Soul' for his recent post about transforming which was the final push or perhaps pull that helped me emerge from my protective cocoon. The issue at my neurologist's office last week when my BP spiked was an awakening as well. I, in my denying my truth about having M S slacked off on my very important exercises and walks - And I have to manage my diet much better because I had been making choices that do not reflect my reality regarding food intake. I believe the neurologist may have saved my life. Actually, not may have, he did. I am on a new medication and I can honestly tell you that I know it is working. I feel quite different in five days. I am drinking at least a quart of water a day. I am exercising daily and either walking and or playing the Wll every day, as well. I am LEAVING MY HOUSE four to five times per week. And, while I am out in public, if someone asks m what happened that I need to use a rollator I will answer them honestly. "I have M S and this helps me do what I like to do". Trust me, it will not be easy for me. I also know how important it is to do so. I have also avoided larger family functions, like wedding or baby showers or barbecues. I told my Mom and Sis that I am going to my cousins baby shower next Sunday with them. They were thrilled because they knew I was hiding but also knew it was my decision when I was ready to "step out". I stopped at other places today and took photos for future posts. When Skipp called and asked about my day and I told him all that I did - I could hear him smile through the phone and he said "My girl is back on top"!!!! 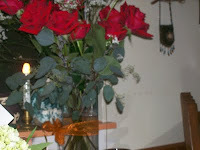 I finally uploaded these two pictures of flowers Skipp bought me for our birthday and anniversary. Lovely, aren't they? 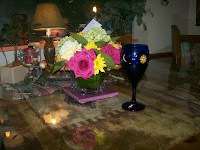 Also, in the photo to the left is one of our favorite wine glasses - deep blue with gold moons and stars. We had a lovely week together - long rides, barbecue, wine and fun food, playing music and singing, movies, slept late and had our coffee out on the deck watching and enjoying nature's bounty. It was a very special, simple, loving time. And so Autumn approaches - the colors are golden yellow with splashes of red and brown. The mornings are crisp and the evenings chilly. And the colors in our home - shadows of dark greens and yellows and borders of slate and deep purple dance around in the morning and early evening light. It is wondrous. I too have danced around some - as you all know I struggled with my wanting to set the stage for my daughter's love language - and felt quite righteous in doing so. The out pouring of love and support I received from all of you, my amazing friends in blog land, touched me so deeply and helped move me to a peaceful place, once again. And I thank each and every one of you. Once I let go of "my way" and embraced "their way" all doors opened - heart soared - voices sung - love was spoken - shown - felt - heard - understood - I know I stirred the emotional pot, maybe that is good every now and then - but for now, and a long time to come, I am not going to stir anything, - rather, I am going to simmer and rest in the love we share - receive it as it is offered - and give as I always have. It was time for a change, better said, a time for me to change. And I have - and so many of you helped me. Again, "thank you"
p.s. I have been a bit 'under-the-weather' since my neurologist appointment on Tuesday. I have not been able to comment and read all your wonderful blogs as much as I would like. I had a harrowing experience at my appointment - I was quite traumatized by it actually. I had a frightening spike in my blood pressure while there. The neurologist got very concerned and thus, so did I!! I went to my PCP right from there. He is so calming. My numbers lowered considerably by the time I got there. He is adding another medication to control the "spikes", which can happen with M S patients due to some type of false signal. Good Lord. So I am taking it easy, doing my exercises, walking outside, resting a lot and drinking lots of water as I adjust to the medicine for two weeks and then see how it is working and if I am tolerating it okay. Again, "thank you" all for your kind understanding. Oh, we did get the disability documents organized. phew. I know that if I wait for others to "behave" in ways that ally with my values so I can be happy that I will always be unhappy. I know this. I swear I do. And I can feel hurt, feelings are not right or wrong but I am the only one who can move past it. Or, better yet, stop setting myself up. Duh. I finally reconciled this today. I spoke with both my girls - and I KNOW they love me. They may not show it in ways that I think they should but once again, I let go of that. I felt such relief. I learned long ago to adjust my dreams for my children to fit my children's dreams for themselves. And I keep re-learning to receive how they show they love me on their terms, not mine. I'll admit, I wanted to be fussed over, planned for, celebrated in grand style. And I was, I just couldn't see it because I had a rigid idea of what that should look like and it had to do with me and not them. I can tell you that never works. phew. Their expressions were as heartfelt as my very different expectations - I know that now. Hindsight is always 20/20 huh? Perhaps as the years go by and I feel them growing in to themselves and their life styles I lose ground every now and then. The love is always there - they would crawl over broken glass for me and I know this, without a doubt I know this. Sometimes I lose sight. In the moment of some unmet expectation I lose sight. And so it is that as a Mother I forgive, adjust, reconcile, accept, and believe. I move beyond my own wonder and hurt and join them in how they show their love rather that some pre-conceived notion of how I think they should. Some times it is a bigger leap of faith than other times. 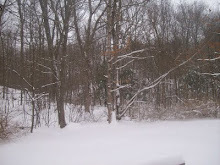 It is raining here in Southern New England, windy, raw and dark and I love it. I am so content on days like this. The sky promises nothing and everything, the air turns upside down with flavors of cold rain and tossed leaves, the ground is soggy and the sounds, oh the glorious sounds - heaven made. I recall this day, 8 years ago - everything changed that day. My son was just a mile from the Towers - his first year at NYU - he could not call me for days because the cellphone towers were down as were most all other phone lines. I watched and listened and prayed and cried in earnest. Now please don't throw tomatoes at me for this next secret told. I wrote to George Bush - I told him I thought that he was like a Father protecting all his children. I felt that for a time - I swear I did. My son finally called - his accounting of the "City" post 9-11 was haunting, raw, honest, loving, hopeful, - he expressed human kind in spectacular ways - and said the hardest part for him was the pictures people showed him of their loved ones they were searching for - He volunteered at Bellvue - no one came. Take a moment or two to listen to the words to this song. Thanks my friends. Now that I know more about your lives and you all know about mine I thought this would be fun to post again. For those of your with kids and grand kids this is amazing to do with them, :-) - Here are the guide lines. This is a guided imagery designed within an imagined walk - you, the reader, will design your own 'walk' and the details of your walk by answering the questions below. Don't jump ahead!!! . The more you use your imagination the more "real" or "true" your answers will be. I will explain what your answers mean at the end. PLEASE don't peek at the meanings. It will ruin the whole thing for you. A few statistics - for people past the age of eleven to twelve their answers will be about 80% accurate. With kids, between say five or six to eleven or so - their answers are 99% accurate. So, if after reading the meanings to the answers and it doesn't apply to you, you are in that 20% for that question. Relax. This is suppose to be fun!!! So stop over-analyzing and just go with the flow. Use your imagination and be creative. Okay? 1- What season is it? 2- What kind of day is it? 3- You come upon a body of trees or a forest - what kind of trees do you see? 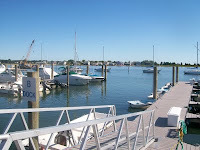 4- A- You come upon a body of water - what kind of water do you see? B- What is the water doing? 5- You look over to your left and you see a container or a box - What is it made out of? 6- You walk over to the container or box - What is inside? 7 - You continue on your walk and you come upon a bear. - What do you do when you see the bear? 8- After you deal with the bear you are now coming out of the woods - 'What do you see as you come out? 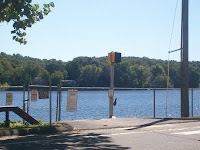 10- What is on the other side of the fence? 1) If you picked SUMMER - that means you have arrived at some major decision in your life. If you picked SPRING - that means something new has entered your life. 2) The way you described the day would also best describe your mood today. 3 ) The trees you picked are reflective of how you see yourself in terms of STRENGTH. Whatever the tree(s) means to you, that is how you understand your own strength to be. Many people choose pine trees - and actually pine wood is soft, however - pine trees are forever green flexible and so forth. So YOU have to look at the qualities of the tree(s) you chose and apply that to yourself. 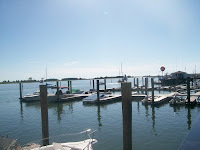 4) The body of water and what it is doing would best describe HOW YOU LIVE YOUR LIFE. 5) The strength of the material of which the box or container is made represents how important your STUFF is. Stuff meaning - life's things, like cars, home, furniture, clothes, - your stuff! So the stronger the material the more important your 'stuff' is. Often, people in transition, or life changes, could care less about stuff and will choose materials like card board, etc. Again, if your answer and the reason given don't make sense than you are in that 20% for that question. Breathe. 6) What's inside is WHAT YOU HOLD MOST DEAR. 7) What you did when you saw the bear? That is how you handle problems. 9) The fence? The fence represents the line between life and death and what you did when you got to the fence is what you would do were you to find out you are going to die today. (for young kids - so not to scare them - you would say the line is between earth and heaven. Well, I hope you enjoyed this discovery walk. I have been doing this for twenty years in a variety of settings and it always gets rave reviews. Feel Free to write and ask questions for clarity. That is a title of a song I wrote and Skipp put to music. I wish I could put it on the computer but I simply do not know how. I can share the lyrics - and I will. I haven't ever written about my eldest daughter - Kristie. She is the one that lives in upstate NY, about 500 miles from here. She has 2 children Leanna and Jacob. She was quite young the first time she left home - she was 16 and pregnant. And so the song "The Innocence Is Gone"
His baptism was a celebration of miracles and life promised and peace and hope. And yes, his song, "Jacob's Song" It was actually a poem I wrote for his baptism and Skipp set it to music. It was later performed at the 'Special Olympics" opening ceremonies and was chosen as the theme song for the Jerry Lewis Telethon and performed at venues all over the state. And so Jacob's miracle of coming back to life inspired so many. We have many copies of this song and it still 'sells' and we make donations to Special Olympics and or "Jerry's Kids" from any tapes we sell. If anyone is interested, please let me know. And so he suffered lack of oxygen which caused brain damage and we were told he wouldn't ever walk or talk. Oh how Jacob defied all the odds - and yes, he has his special issues but he runs and laughs and speaks beautifully - he can fix anything and is quite handsome. :-) And so Kristie's life unfolded as a single Mom of a beautiful daughter and a special needs son. We stood by her and helped her and we all grew together as a family. Over time she decided that she wanted to go back upstate NY. She said she couldn't afford to live in Connecticut and that the cost of living upstate NY was much lower and so she left again - about 8 years ago now. She is a CNA and woks hard. She visits rarely which is heart breaking for me and my ability to travel is minimal. We talk on the phone and she tells me she loves me and yet it leaves me sad - I have missed so much of her life and of Leanna and Jacob's life. Most days I am reconciled. sigh....... She is a "tell it like it is" kind of girl - no holds barred!! She is rough around the edges and has a raw wisdom that is profound. She doesn't care about clothes or make up and prefers jeans and work boots and sweat shirts. She loves horses and all animals but especially horses. I got her, her own horse when she was 10. A wonderful time for us all. 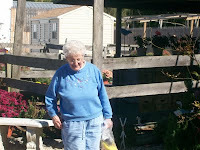 I love hearing her stories about her patients at the nursing home she cares for - she adores them all. She may have left home in distance but her core of goodness and purpose were built when she was a little girl and that is with her always. - and therefore, so am I. I taught her everything I know.